Habitat: Native to Europe, from spain and Italy to Greece, Scandinavia and Russia. Woods (especially oak woods) scrubs, headges, neutral and calcerous soils. Description: Medium-sized, deciduous tree. Grows to 10 meters. Leaves are coarse, oval, and simple. 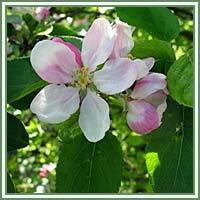 Flowers are five-petaled and radially symetrical, pink to white in color. Medicinal use: The plant is generally considered to be astringent and laxative. Fresh fruit improves digestion. Used fresh, fruit is also an excellent dentifrice. Crushed fruit pulp is used in treatment of inflammations and light wounds. Bark is anthelmintic, refrigerant and sporofic. Cooked froot is used in treatment of sore throat and eye inflammation. Stewed fruit is used in case of constipation. Used as a decoction, bark is useful in treatment of intermittent and bilious fewers. Leaves have anti-bacerial properties, inhibiting the growth of various gram-positive and gram negative bacteria. 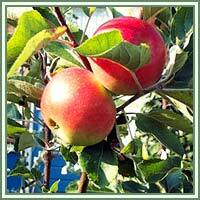 Safety: Seeds and leaves of wild apple contain toxin, hydrogen cianide, which in smaller amounts stimulates respiration and improves digestion, but in excessive amounts could cause respiratory failure and death.